Australia Here We Come but it wasn't to be!!!!! It's thumbs up from Dr Koo for Mom to travel again, this time instead of heading north to America like last year when she earned the title of Unstoppable Mom, she is going to the wild and adventurous land of 'Down Under'! 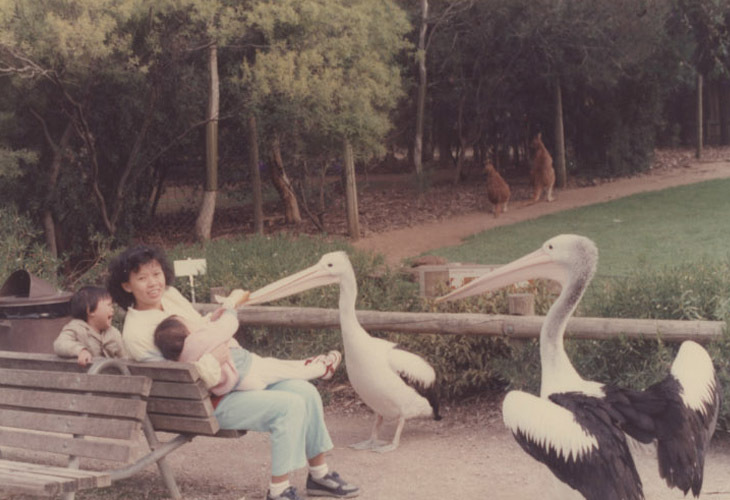 Memories flow back from her first visit there in 1987 when she had to care for two little girls. 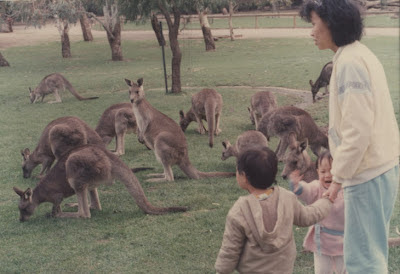 Of course one must see the kangaroos of Australia or you haven't been Down Under! Boy these Aussie Pelicans are aggressive enough to steal hot dogs from a little girl!!! 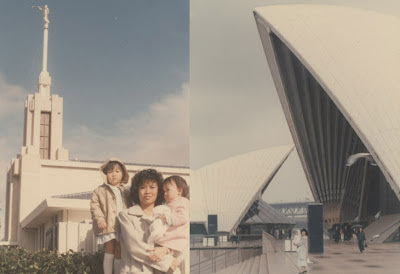 Besides kangaroos, of course one must not miss the Sydney Opera House and if you're a member of the Church, you must visit the first LDS Temple in Sydney Australia! 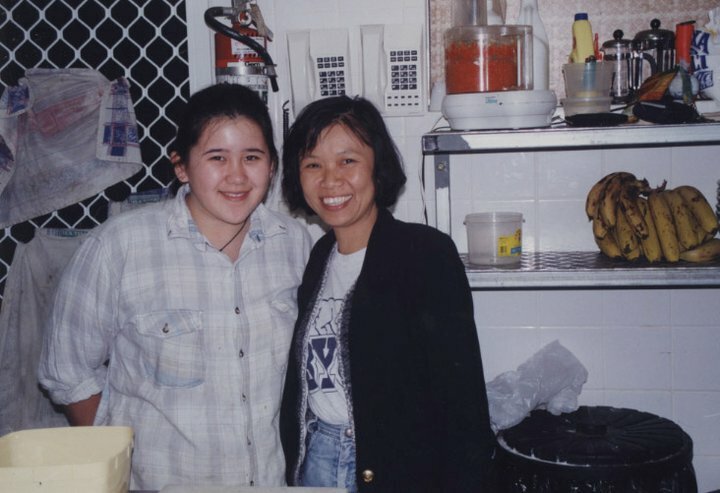 On this same trip, we made it further down south in Melbourne and Geelong area where she got to meet the old friends of Dad's when he was a college student there. 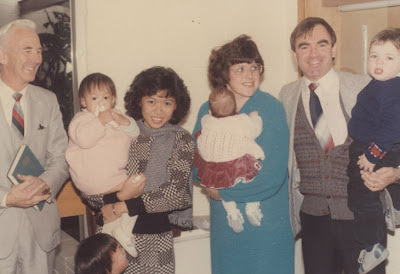 Since Dad had joined the Church in the final year of his University in 1979, there were also Church friends to reunite with! In 1999, she finally got to go further north to the Gold Coast in Queensland to visit her brother! She could even meet her young niece Connie then. Today Connie is married with two children of her own! You can see more photos of our last trip to the Gold Coast here. 24 Sep : Oh we were supposed to leave yesterday and arrive today at the Gold Coast. 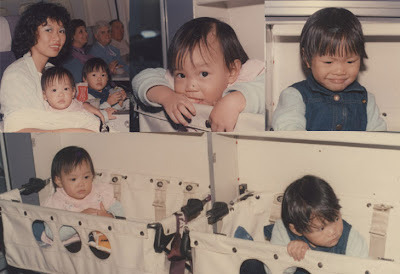 As Mom wasn't feeling well due to catching a flu bug or something over the last couple of days, it was decided after some discussion that it may be best that we delay the departure till she recovers and stabilizes in her health condition, with symptoms eradicated before travelling. A major reason for her to go to Australia is to seek expert advice, drug free remedies and coaching from a friend who specializes in alternative medicine therapy. Please continue to pray for her to be well enough to travel that she can receive the alternate care for her. 1 Oct : Dad begins his 3 day fast and shares his spiritual thoughts here. 5 Oct : Start of the October babies' month of birthday celebrations. Immediately after a morning online celebration at home in Singapore, Mom is rushed to the hospital as per the account here. 15 Oct : Mom had to be readmitted to the hospital again after spending 6 days in her earlier admission. Her abdomen area was accumulating excess fluids during her last stay at the hospital, a condition known as ascites or oedema. A couple of days before being discharged at that time, a simple tapping procedure was done where using a needle and tube, excess fluids were drained for her comfort. This was only a temporary relief as excess fluids began to accumulate again when she had returned home. I was wondering if the doctors knew this would happen, why did they discharge her so quickly after the fluid was drained. On this early morning return visit to the National Cancer Centre (NCC), it was to seek another release of the fluid as the expanded abdominal area created much pain for her. Dr Koo, the head oncologist decided to admit her again, this time to implant a 'cope loop', a type of catheter drainage in medical terms where patient can do it at home by simply turning on or off the valve. It took a while to be admitted and a bed in the corridor of the doctors' meeting rooms was provided for Mom at the NCC building as it was more painful to sit up then to lie down. I was pleading to Dr Koo to have the fluid drained, thinking that at the NCC, they had all the capable doctors and facilities to carry out this simple procedure again. He said it was not possible according to policy as even he would lose his licence to practice if he did it personally! Poor Mom had to continue to suffer. She had been enduring since she was discharged on Wed 10th Oct to go home. She had endured for 5 days of pain in her abdomen and back due to a bursting abdomen filled with fluid that could not subside by ordinary urination. 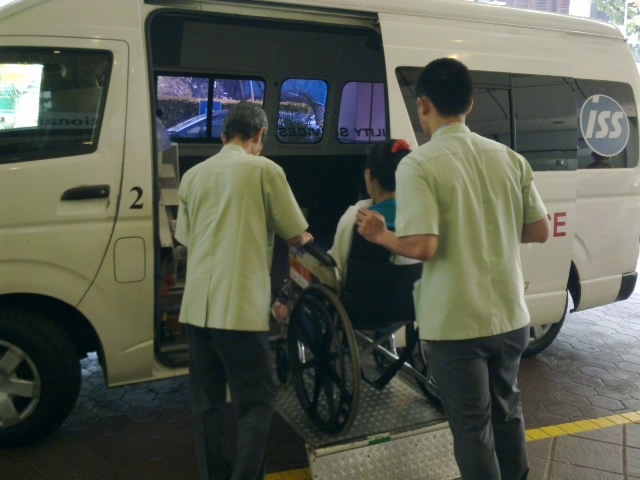 It was only in the afternoon that a ward could accept her in and an ambulance would transport her from the NCC building to the ward. My second, correction, third ambulance ride in my life, but only second for the month of October not counting my accident of 1985. At the new ward in the afternoon, the doctor of Japanese descent informed me that this time, the procedure to drain the fluid and implant the new cope loop would be done by a radiologist so as to safely implant the catheter with a view using ultra sound so as not to damage any internal organs in the abdominal region during the procedure. I was further informed by the doctor that we may have to wait as the radiologist had a 2 to 3 day waiting list of appointments! I pleaded to the doctor to appeal to the radiologist to squeeze in some time earlier if possible and he said he would talk to him personally. He came back within the hour with the good news that they will do it that night itself about 7pm. It took less than an hour to complete and she came back with a new tube and a valve to be able to release excess fluid at recommended times though out each day or night. What a relief we could take care of this first troublesome symptom that arose while at the hospital this month of October 2012! 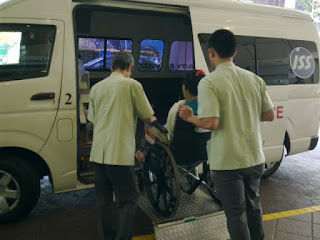 22 Oct : A week had gone by and it's the following Monday now since the readmission. Several more scans have been conducted on last Friday such as CT scan and ultra sound with reports coming back in. The lack of accuracy of the scans or lab tests reports was our concern not to yield to the strong persuasion of the head oncologist to immediately give Mom another round of chemo shots. I was shocked when he told her, without my presence over the weekend, by her bedside in the hospital that without chemotherapy, she would not live past this Christmas! Two incidents caused us to be more alert not to jump to another round of chemo too quickly. In the first admission, the Medical Officer(MO) had announced to me he had good news. (This 'good news' was wrongly conveyed to Han on his Mission in the UK as noted on the Mon 8th Oct journal writings in a post found here.) From the CT scan conducted earlier, he said it showed her abdominal area was clear of cancer. However during a review by Dr Koo, the head oncologist, he showed us the actual photo scan to say that the excess fluid in the abdomen area made it difficult to see anything. He showed us all the fluid that covered up the abdomen area shown by the cross-section photo. Next in the test report of the sample fluids released from the abdomen, the diagnostic words used by the lab report were as follows, "Peritoneal fluid for cytology : - Suspicious for metastatic carcinoma breast primary (see comment). Comment : Due to low cell yield in cell blood. Please submit another sample just for Cell Block for more accurate diagnosis." Dr Koo promised to redo the tests to get more confirmation that cancer is the cause of the excess fluid in Mom's abdomen. He has been recommending that chemotherapy is the best way to stop the accumulation of the excess fluids. More time will go by now for the reports of latest tests or scans to come in before we make any major decision of what to do next! Click the above comments icon showing the number 22 to view them. Click the above comments icon showing the number 15 to view them. 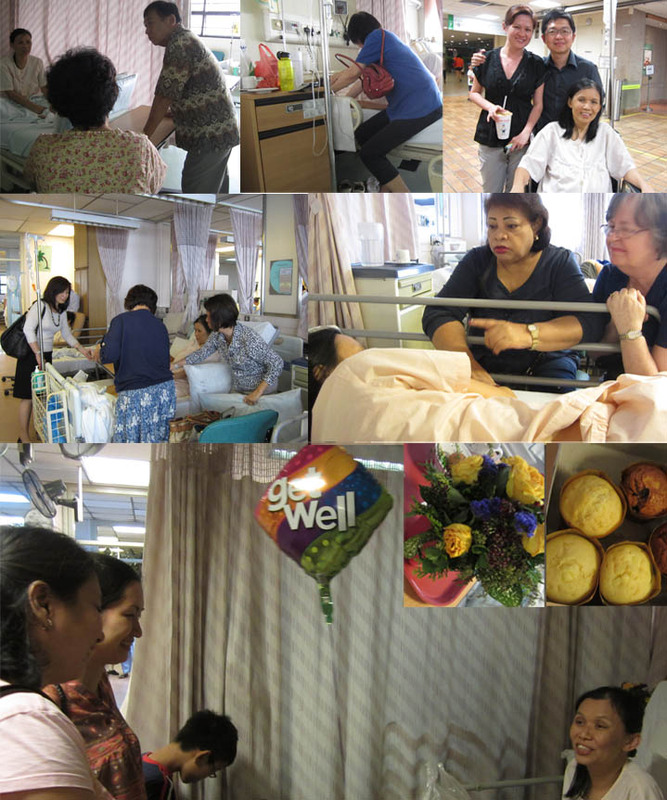 27 Oct : After 13 days in the hospital, Mom was again discharged to go home. This would make it a total of 19 days she had spent in the hospital in the month of October if we include 6 days in the first admission. In the last few days at the hospital, I was shown how to take care of Mom's new catheter to drain the excess fluids from the abdominal area. 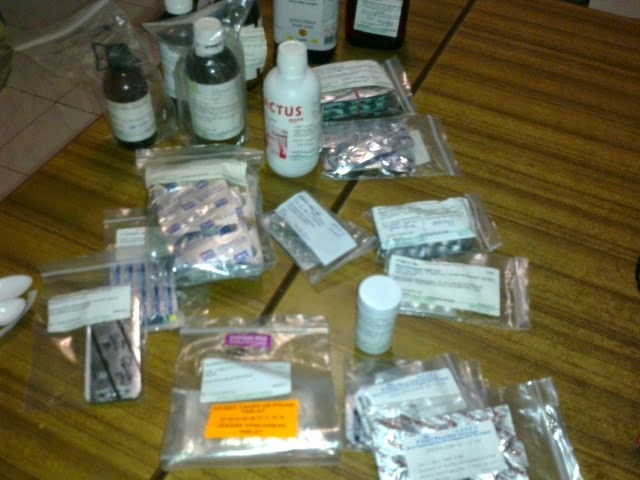 I was also taught to administer drugs to her which included the following : Paracetamol, Tramadol, and Morphine Sulphate as pain killers, MetoCLOPramide for vomiting, SENNA for bowel movement, Lactulose Syrup for softening stool, LoRAzepam for sleep or overcoming anxiety, Magnesium Trisilicate Mixture for gastric and wind. A couple of days home, the hospital had arranged for a nurse from the Hospice Care Association as a follow-up visit for teaching more about the use of the drugs and other things necessary to help take care of Mom better at home. They would send a nurse and doctor to visit a few days later. Meanwhile family members and friends continue to pour their love at home. It was as if everyone tried to meet the needs of the family without us even asking. They would bring food for the boys, wash left over dishes in the sink, sweep and mop the floor, hang out the laundry, trim Mom's nails etc etc. Some went all the way out to buy the rare favorite food Mom missed like Penang Laksa! Some came and were quietly assessing her needs and when saw she was hot in the room, got her an air cooler, another hearing she loves to drink green apple carrot juice got her a juicer! Others then brought supplies of green apples and carrot! Again we couldn't take a pic of all who had come to our home to be of assistance nor make a full list of what they did for Mom and our family! We are just very touched by such kind people in our hour of need. 1st Nov : Just past mid-night, I had just come back with the car I had parked in JB. Friends were visiting about 8.30pm in the night earlier. When I entered the door I was surprised a visiting couple was still there with another neighbor from another block. Mom was having a vomiting spell and traces of blood was discovered. We immediately made a decision to send her quickly to the Accident & Emergency (A&E) centre of the hospital and fortunately I had brought the car home to do it! On arrival she was quickly taken in while I parked the car. When I came to the centre she was already with the doctors in the Observation room laying down in bed with tubes and oxygen mask attached to her. By about 4 am they moved her to an InterMediate Care (IMC) facility in the hospital ward that is just below an Intensive Care Unit (ICU) level of seriousness. On the 2nd night at the IMC, we had a small gathering (broke the rules of minimum 2 visitors only) for a birthday cake celebration of Ray turning 15 with online connection to Fei and Su in the US as recorded in our Nov babies' post here. The next day Mom herself got a gift too delivered to her bed! This was a surprise gift from Su. Double click above to expand the words to read. After conditions for her had stablized with no more bleeding in the stomach, she was moved on the 4th night being a Saturday, to a normal ward. I took the opportunity on the weekend to drive back to KL for the urgent need to renew the road tax of two of my cars else I would not be able to reenter Singapore with them. I must have caught a mild flu over the weekend as I was feeling cold in the car driving the journey despite turning down the air conditioning. As I came out of the car in a rest stop off the highway, I felt cold too outside the car as the weather had been wet or rainy. I looked forward to some hot noodle soup in the food court area of the rest stop. Unfortunately this particular rest stop had a fully airconditioned food court area and again I felt cold. Cold, Cold, Cold all the way! The many cumulative days and nights at the hospital with lack of sleep must have weakened my immune system. In order to recover, I just slept and slept when back in KL till Monday morning to start renewing the necessary road taxes and do minor service on the cars. I left KL on Monday afternoon, Nov 5 to return to Singapore. 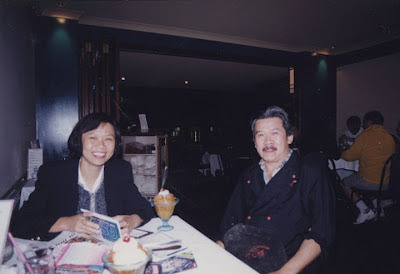 I was in a hurry as I had arranged for my brother from Kuantan, also a doctor, to meet up with the head oncologist Dr Koo Wen Hsin in evening on Monday. The three of us met at a special room on the floor of her Ward. I had raised the point about why the hospital had changed her type of painkillers to one called Fentanyl which seems to have acute side effect of losing contact with reality. I was explained that latest blood tests showed her kidneys had weakened and therefore the previous 'Opium Range drugs' could not be used as it would tax the kidney further. I highlighted the dilemma that on one hand we while we want to increase her comfort level by using a kidney safe product such as Fentanyl, its side effects made the patient lose reality and unable to recognize anyone familiar. But if we want the patient to be able to be present in reality by avoiding Fentanyl and its side effects, they can't seem to suggest any other alternative drug. It was a choice of keeping her conscious with pain or giving her the drug that they feel is the best choice for comfort. I felt this was a choice Mom had to make. I immediately went out to her to relate this to her. It was as if a new realization struck me. All this while I was exercising my full faith in God in trying to get her healed. Praying, fasting with medical and personal attention. I lived with an imagination that I was a Superman, doing everything possible to achieve the impossible. Her nephew from her oldest brother who communicated with me often through facebook seem to have equally great faith of the Savior and we had joint prayers together at the hospital for her healing. She too had manifested her faith in the Savior and in me too with the decisions that I would make for her in her weak moments at the hospital. Furthermore there was an intimate moment at the hospital during the past two months by the window at a quiet corner of a hospital corridor when she said she wished to go there for some natural sunshine. She was too weak to walk outside but wanted to walk along the corridors with my assistance, tired from laying in bed too much! With the sun's rays upon us by the window, we hugged each other closely and kissed, exchanging words of love for each other. She said she loved me and knew that I had always cared for her. If the pain was too much to bear, let go! But at this moment I was struck with the need to tell her how I felt in my heart and mind. I had realized that while we were fighting together for her to live, there was a distinct difference from her experience compared to mine. She was the one experiencing the physical pain and discomfort of the sickness and not me. I also knew she always had a low tolerance for pain. I simply had to tell her if she found the pain too unbearable, it is okay to stop fighting and let go. I told her not to worry about the boys as I would still be around and will do my best to care for them. Since she could hardly verbalize much since coming out of the IMU, I believe she was conscious enough to understand as I had spoken clearly to her and they had reduced the Fentanyl drug for her significantly. 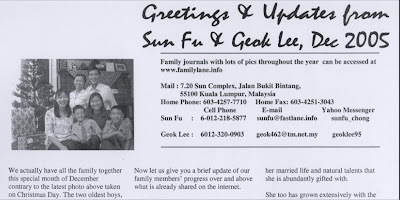 My 3rd brother from KL was there with his wife hearing my very direct statements to Mom. He felt she might not be in the right mind to understand. I explained that having spent intimate moments with her in the month of October where she had spent a record time at the hospital and with all the challenges at home, we have had discussed such hard truths and it was really a critical time for a decision. On the second day of Nov 6, I was with her early in the morning about 5am. I had left the hospital about past mid night earlier telling the staff nurse to call me if she asked for me. I needed to get back to shower and get some rest as I had shot direct to the hospital the previous day without going home nor having enough sleep. I was still recovering from my minor flu. When I came in, the staff nurse reported to me they found evidence of blood in her bowels and had sent a sample for testing. By this time, the nurses were giving me details of everything they were doing or was happening to her, At Geok Lee's bedside, she still couldn't verbalize much but I could see she was in quiet pain. When it came round to 6.30 am, when lights started coming on and things got busy in the ward preparing for the early morning doctor's rounds, she expressed that she wanted to remove her bowels not in her bed in her adult diapers. She wanted to do it on the special commode chair. When I told the staff nurse she said it was not advisable as coming down from the bed and standing first to sit down on the commode chair would lower her blood pressure and would be dangerous for her. She had always in the last few days of the hospital even at the IMU preferred to walk to the toilet, a daily goal she had given to herself in the 19 days spent in the hospital in October. With all her tubes attached to her this time round at the IMU that was an impossibility. Now out of IMU she still tried to do it but was not possible and did it with a pan on her bed with diapers taken out. I went back to our Spore home to check on the boys at about 8am and to get a laundry load going as it looked sunny that morning. A normal ride home on the AYE would take only 15 mins to reach home but this morning it was heavily packed with cars and it took about an hour to reach home. The radio reported accidents in several of the city state highways including AYE so that explained the pile up. On reaching home, I found Ray and Shuan still asleep and Ern had already left for a morning O Level subject exam. His O levels exams have been going on in the past 2 weeks. I got busy with the laundry and thought of making more carrot apple juice to bring to Mom before lunch time. A female doctor of Vietnamese descent called me from the hospital about 11am explaining to me Mom's deteriorating condition and what treatments they were giving her. Blood was still present in the bowels in the morning so this was not a good sign. I told her I was just finishing up at home and would be leaving back for the hospital to continue our discussion. I took the opportunity to immediately call Fei and Su to update them of this. They had planned to arrive the following week but now will change their flight plan for the earliest flight in. A Miracle ending with the Lord's mercy. Just before noon time one of Geok Lee's friend at the hospital (Janice) called me up to say Geok Lee wants to see all 3 boys and we were to hurry. I woke up the two boys to sound the alarm and on checking with Ern, he said he had receive a call from the Church friend Cecelia to do the same and we arranged so that I could picked him up from the bus stop near the home as he was already on the way. Mom spent time talking in soft weak tone to the 3 boys together by her bed side. They were told to stay strong in the Church and never give up! I continued my conversation with the Doctor who revealed that her vital signs were not good as blood in her bowels reveal that she is bleeding at various parts of the body. She would immediately be giving her a recharge of blood plasma, platelets, red and white blood cells separately, noting that this is just temporarily as the body was failing to produce its own. Ray, Shuan and myself went down with my doctor brother and wife from Kuantan for a break at the hospital's cafeteria about lunch time. Later more visitors of friends and family were already at the hospital and I was asked to go back to the ward. At the ward I called Fei and Su individually to let them talk to their Mom. They had already arranged their flight to arrive at 1am by Su on Thur Nov8 and Fei by noon time on the same day. I highlighted to Mom that her girls were coming only in a couple of days. Asked her if she could hang on to wait for them and she gave an affirmative nod. After Su had finished talking to Mom, a surprise call came in from the UK from Elder Han Chong! The timing was almost immediately after the call with Su had finished when I had just retrieved back the phone from Mom. I was surprised when the cell phone rang just at that moment. I looked at the number with a strange #44 area code to answer it and heard the voice of Han on the phone. I was totally caught by surprise as I didn't plan on calling him as he was on a mission with no phone number that I knew which I could call to get him immediately. 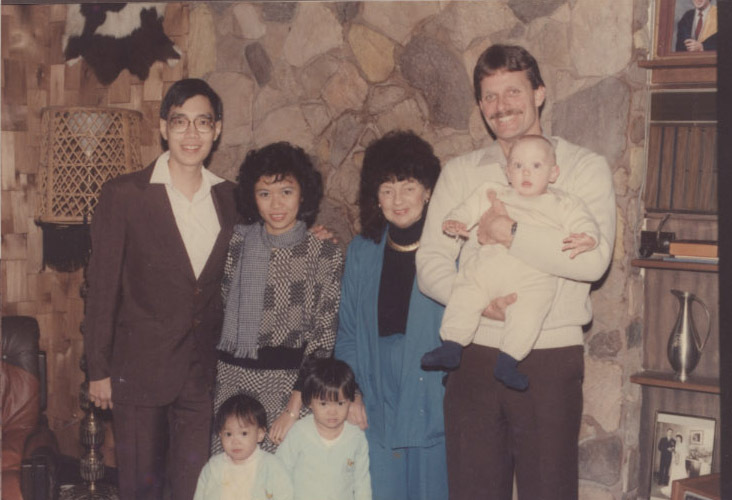 Unknown to me, the Singapore's Church Stake President, Stephen Lai, had earlier contacted Han's mission president in Manchester, Robert Preston, to inform him of Mom's serious condition at the hospital. It turned out that when the Mission President was having an early morning interview with Han, the rest of the boys and I were by Mom's bedside. He informed Han his mother was not well and told him to make a call home by passing his cell phone to Han to call my number in Singapore. She passed on after feeling satisfied she had spoken to all her immediate family! It was a long day and Shuan had skipped his afternoon classes and felt he needed to attend the evening class. I took him to his college and Ray followed me back home to have dinner. At about 8pm, I got a call from my Sister in law of my 4th brother in tears asking me to rush to the hospital now. I immediately felt it must be a 'last breath' situation and Ray and I shot off to the Ward. A member of the Church would pick Shuan there. My 4th brother and his son was waiting at the porch of Blk 5 of the hospital to take over my car so that we could immediately rush up. When we got there, my sister-in-law was crying, I hugged her. She told me Mom had already passed on. I informed her we kinda did our last good byes as a family in the afternoon. I guess Mom, who was fighting with pain to hang on, finally had decided that afternoon to say she was going so that we could say our last good byes. We went back for dinner thinking to come back to see her in the evening but at 8.06pm of Nov 6, 2012 she gave her last breath! God Bless Mom who now is in a definitely much happier pain free place, an even better place than Australia that we had planned to visit again! Play the video clip to hear which woman said 'I am Unstoppable'.